Stock up on frozen items. Frozen fruits and vegetables aren’t too expensive and actually come in a very close second to fresh. Also, this helps when done consistently and even more so great to have on hand when you are low on cash. You’ll be more likely to go for what’s in the freezer if it’s available and less likely to order from the dollar menu. You could also buy fresh fruits & veggies when they’re in season (in season items are always more cost effective) and then freeze them yourself if you’re feeling up to it. HAVE A LIST! It is so important to have a grocery list with you while you’re shopping. Try to focus on sticking to it (hardest part). That being said, in order to have a list, you must plan most of your meals. It seems like a lot at first, but this is a win-win for both healthy eating and saving money. Oh, and one last thing, don’t shop hungry… bad things happen. Figure out what your budget is. Write out all the bills you have for the month and decide how much you want to put toward your food budget each week. Something new I’ve been trying is to then take that amount of money out of my account so I have it in cash. Cash is a great visual! You will realize what you’re actually spending. Also, it will stop you for grabbing items like a crazy person that are not on your list & will force you to look at more prices. Know where to shop for certain items and don’t be afraid to shop around. I don’t think it’s any secret that KFIT & Trader Joe’s are like besties. Besides the fact that the people who work there are friendly and their stores are beautifully organized, you cannot beat the prices on most items. I do the majority of my shopping there. For other items like collagen, protein powders, etc., I will shop online to find the best price (usually end up going with Amazon). To stock up on frozen items & get fresh produce, I will go to Market Basket when I have time. Lastly, and maybe somewhat surprisingly, I love Target for lots of grocery items; you’d be surprised at the freshness & quality at a competitive price (this last bullet sounds like a commercial, but I promise I’m not getting a kickback). PS- because I LOVE that this topic was requested, I will be adding a Farmer’s Market Review in the Spring, as that is another great way to watch your wallet. Bring quinoa and water to a boil while covered. Turn it down to low heat and continue cooking for around 10-15 minutes until fluffy and light. Check the package for specific instructions. Then, add in your almond milk, mashed banana, maple syrup, peanut butter, and salt. Continue cooking until the desired texture is reached. Serve in a bowl and top with anything you like. Heat olive oil in a large skillet over medium-high heat. Add garlic and jalapeno, and cook, stirring frequently, until fragrant, about 1 minute. 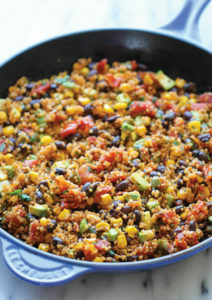 Stir in quinoa, vegetable broth, beans, tomatoes, corn, chili powder, and cumin; season with salt and pepper, to taste. 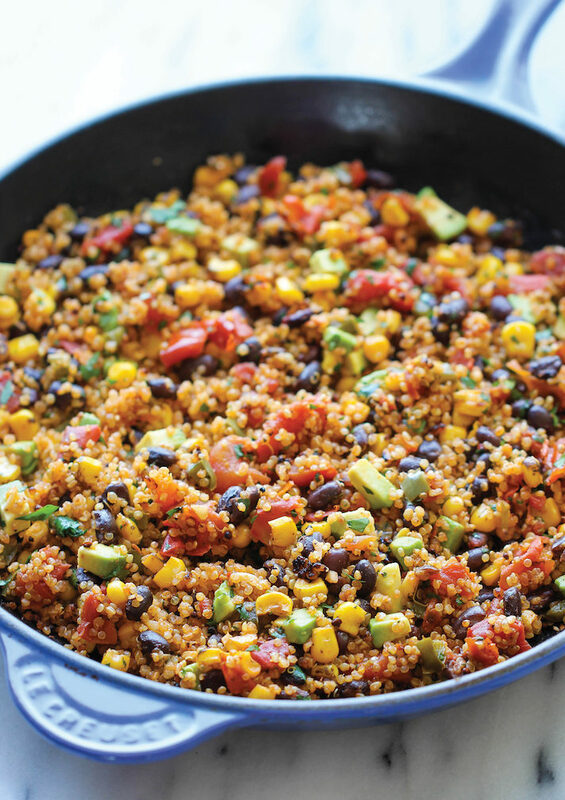 Bring to a boil; cover, reduce heat and simmer until quinoa is cooked through about 20 minutes. Stir in avocado, lime juice, and cilantro. 1. Dice the onion and mince the garlic. Cook the onion and garlic in a large pot with olive oil over medium heat until softened (3-5 minutes). 2. Drain the canned chickpeas and add to the pot. Also add the tomato sauce, water, and curry powder. Stir the pot until everything is evenly mixed. Bring the mixture up to a simmer over medium heat. 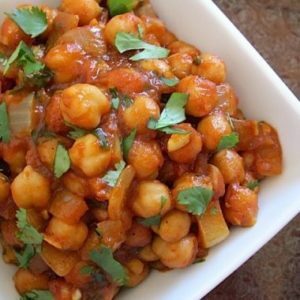 While the chickpeas are simmering, rinse the cilantro and pull the leaves from the stems. Roughly chop the leaves and add them to the pot. Give everything a stir and continue to simmer until the sauce has reduced to a thick consistency (about 20 minutes total). Stir the pot every few minutes to prevent the sauce from burning and sticking to the bottom.